Western Horseman is the world’s leading magazine devoted exclusively to Western stock horses and the Western equestrian lifestyle. Now you can enjoy the same publication on your iPad. This free app will allow you to either purchase individual issues for $4.99 or subscribe to a paid digital version of the magazine. With a paid annual subscription, each new edition of Western Horseman magazine will be delivered straight to your iPad. That’s one full year of access for $23.99 featuring the same great content as the print version. You can read the magazine on your device by downloading individual issues or enable Newsstand to automatically download for you so you can take them with you to the barn, the arena or anywhere your travels take you. 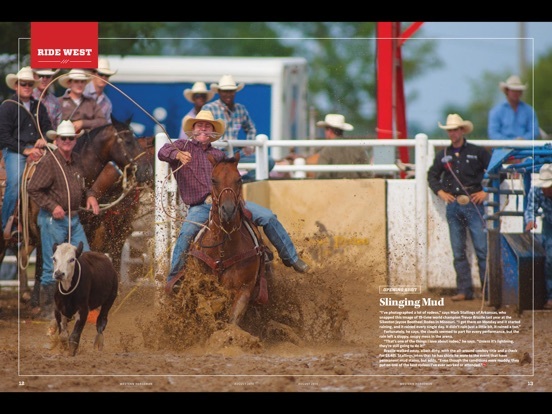 • Special sections on ranching, arena competition, cowboy style and hands-on horsemanship. • How-to training tips from America’s leading trainers and clinicians. • Profiles of America’s oldest and most successful ranches. • Stories about saddlemakers, painters, silversmiths and other traditional cowboy artists. Subscribe to Western Horseman today and become a better horseman in one issue!